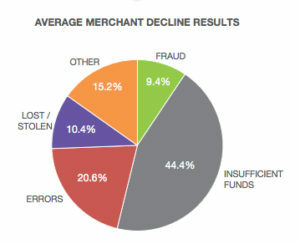 A high volume of credit card declines can lead to a series of negative consequences for merchants, including penalties from the payment network that gradually increase as high denial ratio remains unsolved for a long period of time. However, finding the most optimum solution will depend on the type of declined transactions that a merchant experiences – and in this article, we will show you the most common reasons why a company might have a high denial ratio. Denied transactions cost businesses money. According to different studies, in the majority of cases when a credit card is declined, only 25% of the customers try out an alternative payment method, whereas 39% directly abandon the sale. But this is not the only negative impact that declines have on businesses: in fact, having a high denial ratio can lead to penalties applied by the acquiring bank in response to the request of credit card brands. This ratio depends on various factors such as the composition of a merchant’s user base and the industry in which he operates. In addition to penalty fees applied per denied transaction, payment processors will impose even bigger fines after the third consecutive month of non-compliance with the standard ratios. The merchant will remain in the non-compliance phase until he has accumulated at least 3 consecutive months of compliance. According to Ethoca, more than 44% of all denied transactions happen because the payment method selected by the customer didn’t have sufficient funds (in case of debit cards). If the customer tried paying with a credit card, it simply means that he has hit the credit limit, and his issuing bank won’t allow the purchase to go through. As a merchant, there is little you can do if the customer does not have sufficient funds in his bank account. To reduce this type of declines, make sure to offer additional payment methods for the purchase, and make them easily accessible by the customer at checkout to prevent him from abandoning the shopping cart. The second most common reason for credit card declines (20.6%) is that the customer mistakenly entered erroneous data while entering his payment details. As a merchant, you can reduce the number of declines due to transaction error by tokenizing the credit and debit cards of customers who have previously purchased a good or a service with you. By using a PCI-Compliant Payment Gateway, you can safely store and recover their data for future payments or the consumption of subscription-based services without the process of manual introduction of data. This way, you can reduce the volume of declines due to transaction error. According to the research conducted by Ethoca, about 10% of credit card denials happen because the rightful owner reported the payment card as lost or stolen – as a result, the transaction was declined by the issuing bank. In this case, it is recommended to not retry the transaction neither to provide additional goods and services to the cardholder. In case of a stolen card, make sure to report the transaction attempt to the corresponding issuing bank. For scheduled transactions, it is possible that the card could have been lost before the transaction went through; in this case, get in touch with the cardholder and ask for a different form of payment. Another common reason for declines is that the credit card company observed an unusual activity on the credit card. Some activities may include shopping in neighbourhoods that are known for fraudulent practices, sudden change in shopping habits by the cardholder, and sometimes even making small purchases is enough to trigger a decline if the transaction looks like testing. Usually, before the thief starts spending frivolously with the stolen credit card, he will test it out to see if it works by purchasing an item for a small amount, or just filling up the car at the gas station. If a customer typically buys gas in the same area of your location but you suddenly fill your tank up in another part of the city, an alert can be triggered as well. Similar to uncommon activity, making a purchase from an uncommon location can also trigger an alert of suspicion for possible fraudulent practices. Typically, your credit card issuer is familiar with the geographic boundaries of your regular transactions, and making purchases from another country (even if they are not actually fraudulent) can sometimes alert issuers. In other cases, if the card issuer observes that purchases are made at great distances from one another in a suspiciously short period of time, this can also be a red flag for fraudulent activity. Another common reason for credit card declines can be as simple as a change in the shipping address of the customer. If the issuer doesn’t recognize the new shipping address and it doesn’t match his usual billing address, the transaction could be declined. If the customer uses a payment card to rent a car and then uses the same card for checking into a hotel, the sum of both temporary holds might put him over his limit, causing the second transaction to be denied. There are many reasons why a merchant can experience a high volume of credit card declines. In case of a possible fraudulent activity, sometimes it’s wiser that you not encourage a retry even if it means a loss of potential revenue for you as a merchant. In other cases, the problem can be solved by requesting another payment method by the customer, or tokenizing the payment card details through a PCI-Compliant Payment Gateway that allows you to store credit card data safely.